This is a sort of transition (no pun intended) back to racing seriously again year, so I’m focused but trying to make sure I enjoy myself and don’t get lost in the obsession of it all! So, I’ve done early season races with the University of Stirling where I’m studying at the moment, but bizarrely as the undergraduates have all gone home the Uni season is finished!! Therefore, I am taking part in a few local races (in between trying to collect Wainwright’s!). 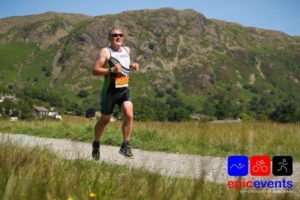 I competed at Coniston when it first started and again in about 2012 (I think it was). This is not a race that is enhanced by bad weather….. therefore I entered last Wednesday, once I was sure the rain was staying away! And what weather, pretty much perfect as far as I was concerned, though some might have found it a bit warm. Setting: on the edge of Lake Coniston (though bike transition is up the hill – more of that in a moment). Simply stunning. 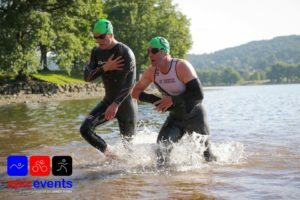 Organiser: Epic Events, sanctioned by British Triathlon (with referees present). Registration: Saturday afternoon or Sunday morning in time for a social 8am start (no 3am feast required). Swim: it was a balmy 17c in the lake. One lap of a buoyed rectangular course (not really swimming directly into the sun, except on the short end of the course). Deep water start, split into 2 groups with faster swimmers going off a couple of minutes early, removing that unpleasantness of faster swimmers starting At the back and coming through. Transition 1: it is a bit of a pain to get to T1 as the bikes have to be racked about 800m up a little hill (in the early years transition was by the lake but the locals on road exit complained so it was a case of move transition up to a top field or cancel). Anyhow it means taking wetsuit off, putting some trainers on and running up. I’m not a big fan of uphill, but it’s not too terrible. Bike: bike course is a little bit lumpy (my Strava has 595m of vertical). The ride heads out through Torver, on the A593 until A595 which you follow over the big hill at about half way (but do get the down too) before crossing back to Lowick Bridge and heading back to Torver. The views in places are awesome; of course I was concentrating! I decided I’m not strong enough for my TT bike given the undulations, which for me was the right call. But that’s very much personal preference. There were a mix of road, road with clip on bars and TT bikes. Finish: alongside the lake, there was a commentator dressed up to encourage and greet everyone back. Prizes for overall M/F 1,2,3 plus age groups (10 yr groups from 40+). Everyone gets a tshirt and finisher medal. 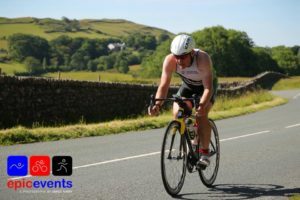 Reflections: This isn’t a course for a PB – the winning time was 2h15! But I had a good race, enjoyed it and finished higher up the field than I expected. Also managed to get sunburnt and be back home in time for the England game. In a nice touch, Epic upload race pictures for no extra cost to their Facebook page; shame I missed the opportunity to get Kendal kit, but the Uni are pleased I wore theirs!